We help veterinarians across Canada think through the best insurance strategy for their veterinary clinics and hospitals – so they can focus on caring for our pets with confidence in their coverage. Whether your veterinary practice offers general care for house pets, services large animals, or offers specialty clinic options you need to have the proper coverage in place. The McConville Omni team will help you explore the risks and rewards. We'll guide you to consider legal expense coverage, which helps cover potential employee disputes to CVO disciplinary hearings, and we'll cover all the bases for general business and professional liability. 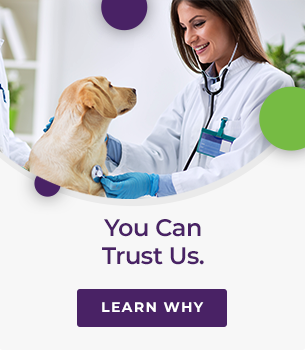 We'll lay out all the options, clearly in a way that makes sense in your world and you can pick and choose which coverage you would like for your veterinary clinic. How is Professional Liability different from General Liability? General Liability policies normally exclude this type of coverage. Our vet program policies include this valuable coverage. What is Boiler & Machinery insurance? Boiler and Machinery is better described as Equipment Breakdown insurance. Our vet program package includes this coverage. Why should I have a Legal Expense policy? Employment disputes, tax investigations or preparing for defense in a disciplinary hearing all incur large expenses. Our vet program package includes coverage for this, which also provides access to general legal advice 24 hours a day, 7 days a week. Is there insurance for myself and my staff if we are injured while working? Yes! Our vet program offers a special accident coverage that is available to you and your staff if you are hurt at work. The coverage has no deductible, no waiting period and may be used in conjunction with other accident insurance you may have. The personal auto policy is designed for the normal driving situations of the average person. Whereas commercial auto policies address the unique needs and situations that arise while being used for your business. If you are using your vehicle in the course of your business, such as going on a house call, you need to have it insured on a commercial policy. Call us to discuss if you are unsure if your vehicle should be classified as commercial use.